In the Britain, October is National ‘Free Wills Month’ during which time well-respected charities offer members of the public over the age of 55, the opportunity to have simple Wills written or updated free of charge by using participating solicitors around England, Wales and Northern Ireland. Of course, these Charites will hope to be left something in these Wills. Most of us know that Wills have been written for many hundreds of years, but originally only those in privileged society, who had sufficient wealth and possessions to pass on, could afford to have one created. Our less wealthy ancestors, however, may also have written a Will. In 1830 a miner from Gloucestershire, wrote a Will, leaving his house, land and outbuildings to his wife and sons, the whole estate was valued at less than £100 when he died three years later. He clearly owned property rather than renting which was the norm, but he could never be classed as being part of the wealthy elite. 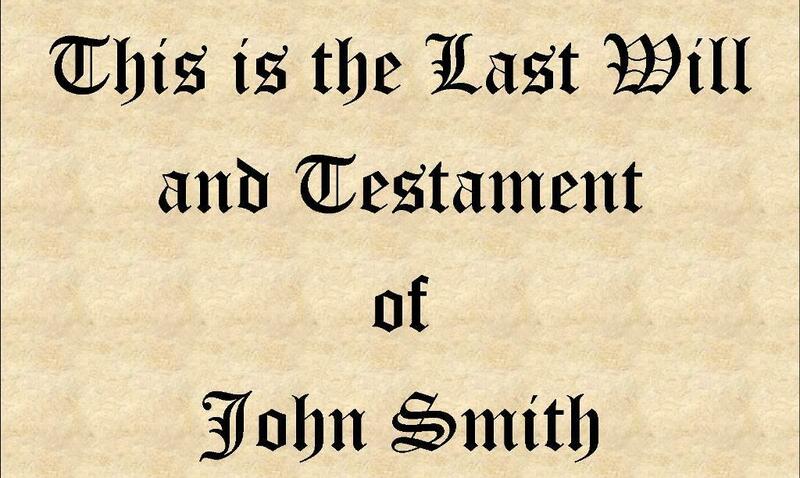 Wills in general often begin stating that ‘This is the last Will and Testament of ….’, so it may not be immediately obvious that Wills and Testaments were in fact two different things, and originally they were written separately. The Will dealt solely with immoveable property, such as buildings and land, whereas the Testament dealt with personal possessions, such as money, furniture, animals, debts and other belongings. Church law, however, meant that one third of these should be given to the widow and one third to the children of the marriage. The rest could be disposed of how he wished. Wills and Testaments became part of the same document about the 13th Century. Some of my clients have queried that the eldest son is not mentioned in the father’s Will and wondered if he had been dis-inherited. Unless this is specifically mentioned in the will, it is unlikely. Originally, the eldest son inherited by primogeniture – i.e. he automatically inherited his father’s property. In addition, some children may have been given their inheritance before the father had died, and so may not be mentioned in his Will. Wills are a great family history resource, not only because the value of the estate, but also because they reveal relationships (personal and business), indicate succession and may contain names and place information. One Will I founded stated that the deceased wanted to be buried with his parents, and gave their names and the location of their grave – which was in a different County to the one he was living in. One of the Wills I have read listed a young grandson who was to be looked after and educated, his parents however where not mentioned. This was because he was an orphan and being looked after by his maternal grandmother. It was a great way to confirm the family of his mother at a time when birth certificates had not been created. Before 1858, Wills were administered by the Church of England in the area the Testator, the person who wrote the Will, had lived. This was a complicated affair because if the Testator held land that covered different dioceses then the Will could be administered in several different areas, with the relevant paperwork staying in that diocese. There are several Acts of Parliament that affected the provision of making Wills throughout the centuries; however the following Acts still affect us today. This Act increased the age of those who could make a Will to any adult over the age of 21 years with the exception of: married women, the insane, prisoners and those excommunicated from the established church. Previous to this the age was ‘men’ from the age of 14 years and ‘women’ from the age of 12 (until she married). After marriage, women could only make a Will with the consent of her husband, and he could withdraw his consent at any time – even just before her Will was administered. At this time a married woman’s personal possessions only included her clothes (however some Church Probate Courts also included her bed, jewels and ornaments). Before this Act women’s personal items automatically became the property of her husband upon their marriage. For this reason a husband may stipulate in his Will that his widow would only inherit his property until she remarried, at which point it would go to another family member. This was to prevent another man taking possession of his family property, and a reason perhaps why the widow did not remarry. From 1837 Wills were required to be written, making verbal Wills invalid except for members of the military prior to being killed in action. In addition a Will had to have at least two witnesses who could not be bequeathed anything in it, however creditors could be witnesses and still receive payment of any debts the deceased owed them. This was an attempt to stop fraud, and even murder, after forcing – or forging – a Will to be made. If a man had made a Will and then his marital status changed, he needed to revise his Will to reflect his new circumstances. The marriage of the testator would automatically invalid any previous wills made, as the wife would be expected to benefit from it. The Wills of non-conformists including Roman Catholics had to be proved in the ecclesiastical courts to be legally binding. This Act abolished the Church Probate Courts to create a single, secular and National Court of Probate for England and Wales with 40 districts, and allowed applications for probate to be made at local Inland Revenue offices. This meant that all non-conformists could now use the same probate procedure without the need of a Religion they did not adhere to. The probate procedure was also simplified to allow executors to appear in person rather than employ the services of Ecclesiastical lawyers, as they charged high prices for this service. This change made it became cheaper to undertake the duties of the executor. Before this Act the original Wills would be returned to the executors once the process of probate had been completed, or kept by the relevant ecclesiastical court. For this reason many early Wills either have not survived or are held in private collections. Since 1857 applications for probate and letters of administration (for those who died without leaving a valid will) have been indexed in the National Probate Calendar with original applications (or copies, if the application was made at a district registry) being kept in the Principle Office in London. District Registries also kept their own indexes. It is these Probate Calendar Indexes which you will find on websites such as Ancestry, however your local archives office may also have a version on microfiche or film. Indexes cover the whole country and are not separated into counties. The following is an example from the Probate Calendar for 1912. In the example shown above the entries for Alfred Ernest and William George both say probate – i.e. they had a Will, however the reference for Rowland Henry says Administration i.e. he did not have a will. Note that it records the names of the Executors (those who will administered the Will) and not everyone who will benefit from it. 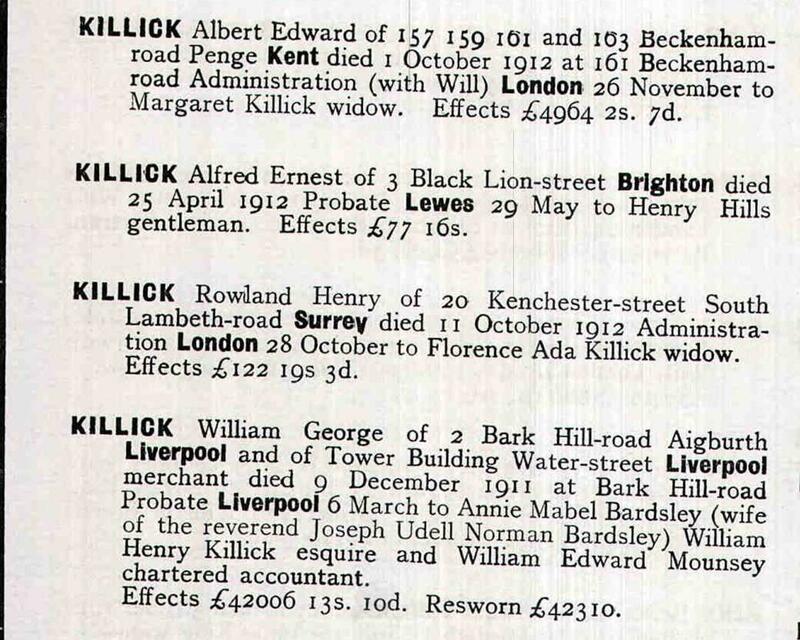 Therefore the Executor for Alfred George Killick was Henry Hills, the executor for Rowland was his widow Florence and for William George the Executors were: Annie Mabel Bardsley, William Henry Killick and William Edward Mounsey. The last entry shows the value of the effects has been resworn. This means that in the process of Probate the overall value was found to be more, or even much less, than originally believed. This Act allowed married women to hold property in their own names for the first time and to bequeath their property in Wills without requiring permission from their husbands. With this right also came extra responsibilities. The Act recognised women’s rights to own and dispose of land and property and also created the right for a woman to sue or be sued. Women could hold stocks and shares and were now responsible for their own debts. – Nothing is for free! As Wills are now kept in a centralised location you can order a copy of them from the Probate Service. The current fee is £10. You can access the PA1S application form from https://www.gov.uk/wills-probate-inheritance/searching-for-probate-records or order online at: https://probatesearch.service.gov.uk/#wills . Using the online service you will receive access to the Will which can be downloaded usually within a couple of weeks of placing the order. To access Wills prior to 1838 read the guidelines from the National Archives. http://www.nationalarchives.gov.uk/records/looking-for-person/willbefore1858.htm. The National Archives are based in Kew, London and hold copies of some Wills dated before 1858.